By Brian Hoey. Aug 19, 2015. 9:00 AM. Truly, Ogden Nash's humor is still alive and well. A look at both his written verse and some of his off-handed remarks is delightful, and it proves just how impeccable his wit and timing continue to be. It is, perhaps, fitting that one of Ogden Nash’s middle-era poems was titled "Portrait of the Artist as a Prematurely Old Man." Where James Joyce (whose A Portrait of the Artist as a Young Man (1916) Nash’s title pays homage to) began his career with the dour naturism of Dubliners (1914) before eventually landing on the lighthearted, pun-driven language experiment of Finnegans Wake (1939), Nash skipped right to the latter. In so doing, he established himself as one of America’s most beloved producers of light verse and one our most reliable fonts of jocular wit and wisdom. Though his most well known rhyme may be “Candy/Is Dandy/But liquor/Is Quicker,” the much-loved poet is far from a one hit wonder. 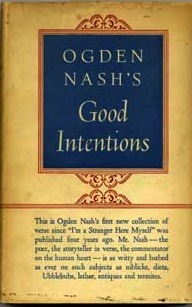 While Nash professed himself to have thought largely in rhymes since childhood, some of his most pointed statements needed no versification. “A door,” he remarked, for instance, “is what a dog is perpetually on the wrong side of.” He also queried, “Every New Year is the direct descendant, isn't it, of a long line of proven criminals?” Equally well-known and quotable are his offhand remarks: "Progress might have been all right once, but it has gone on too long" and "People who work sitting down get paid more than people who work standing up." 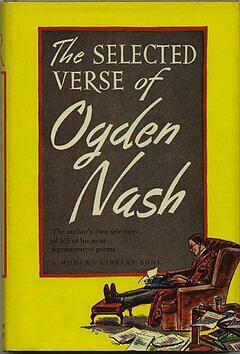 In such a large oeuvre as Nash’s (1945's The Selected Verse of Ogden Nash is a veritable treasure-trove), it can be hard to narrow down a definite group of the finest moments. If one were to attempt such a feat, however, one might find the inclusion of "Song of the Open Road" to prove irresistible. A parody of Joyce Kilmer’s "Trees" (“I think that I shall never see/A poem as lovely as a tree”), it proceeds thusly: “I think that I shall never see/A billboard lovely as a tree./Indeed, unless the billboards fall,/I'll never see a tree at all.” It may not be Nash’s best remembered verse, but it is an acute reminder of all that which keeps Ogden Nash alive and well in our collective imagination: his playfulness with meter and rhyme, tempered by a wit that drew from the absurdities of poetry and modern life alike.